A 43-year-old man was remanded in custody charged over a major dissident republican explosives haul. The large cache was found on a farm close to the border following a covert surveillance operation. Barry Francis Petticrew was arrested last Wednesday by police investigating dissident republican activity uncovered the weapons in farm buildings. Petticrew, from Drumbroghas, Swanlinbar, Co Cavan, replied “yes” when asked if he understood the charges him during the brief hearing at Enniskillen Magistrates Court. He is charged with possession of explosives and ammunition with intent to endanger life and also of possession of articles likely to be of use to terrorists. District Judge Nigel Broderick remanded him in custody for four weeks. The defendant did not apply for bail. * and forensic suits and gloves. The suspected arms and bomb making equipment was recovered during a four-day operation by the PSNI on an isolated farm on the Caldragh Road, Tully near Kinawley, Co Fermanagh. 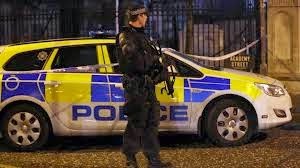 A detective from the PSNI’s Terrorist Investigation Unit (TIU) told the court he believed he could connect Petticrew to the charges. Petticrew was remanded in custody to appear back in the same court on November 10 by videolink. There was a heavy police presence in and around the courthouse for Petticrew’s presence. Armed police from a specialist firearms unit supported Tactical Support Group units were present, stopping traffic for his arrival and leaving the court building.